Registration is CLOSED. Thank you for another great summer! Registration for SummerTimes is OPEN! For more than 42 years, the SummerTimes Program at St. Stephen’s & St. Agnes School has been a place for campers to discover new interests, learn new skills, and meet new friends. Campers can pursue day, specialty, and sports camps, along with summer studies and various auxiliary camps. The SummerTimes camp program is committed to providing families with a flexible program that fits their busy lifestyles, and they can also take advantage of extended day programs before and after camp. SSSAS offers campers a fun and enriching experience designed to stimulate curiosity and creativity, develop talents, and encourage exploration and personal growth. *Newcomers Discount! 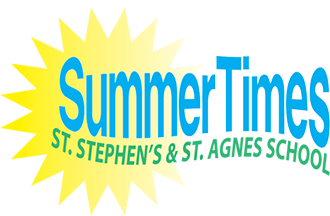 If you are new to our SummerTimes Programs, you are eligible for a 10 percent discount! If you are a first-time registrant and new to the SSSAS community, you may receive 10% off the cost of the first camp you sign up for this summer. Learn more at www.sssas.org/summer.